The slogan of my title is taken from a UK advertising campaign promoting travel to Malaysia. I found it an intriguing description of a country I knew very little about. Firstly, what exactly ‘is’ Asia? How can you possibly define a continent so large and varied? The answer I found is that Asia is undefinable. It contains a plethora of cultures, peoples, foods, landscapes and climates. In a way, though, Malaysia did encompass this definition of Asia. It was more of a mix of religions, foods, nationalities and geography than any place I had visited on my travels thus far. In fact, I found Malaysia to have everything you could possibly ask for in a country and well worth the three weeks I spent there. Watching sunset on Langkawi Island. I entered Malaysia via boat from Thailand and was immediately won over by the beautiful island of Langkawi. The beach is wide, white and quiet enough. There is a good choice of eateries and places to stay – although there is an emphasis on higher-end establishments versus backpacker joints. Even better, the island is duty free so alcohol is wonderfully cheap. On a day trip around some neighbouring smaller islands I swam in a chilly freshwater lake famous for helping infertile women conceive. There were some rather naughty monkeys around who didn’t hesitate to rob tourists of any food they mistakenly carried about their person. To be fair, we were warned by a number of signs simply reading ‘Monkey Attack’. 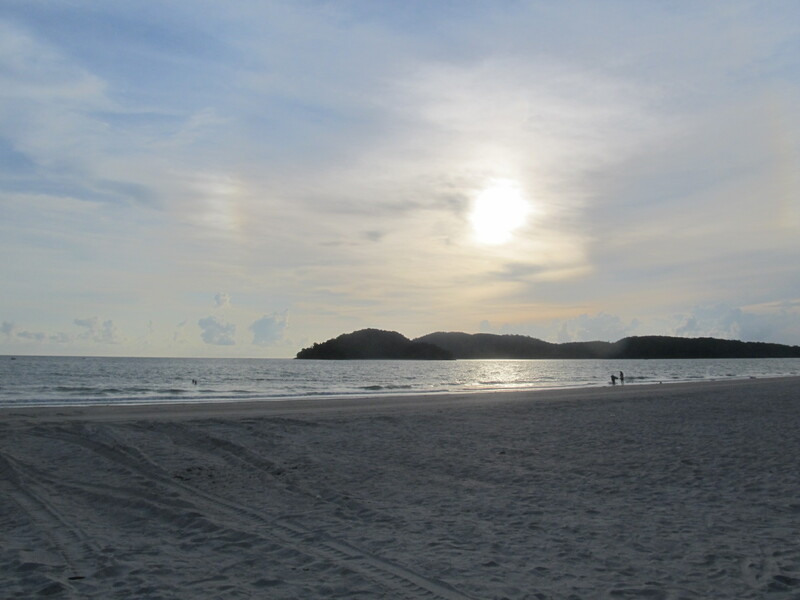 Langkawi was a relaxed, attractive island to spend a few quiet days. I didn’t want to leave after three days, but the rest of Malaysia was waiting. Beautiful temple hidden amongst the streets of Georgetown (rain rain go away). This is the island for culture in Malaysia, supposedly. 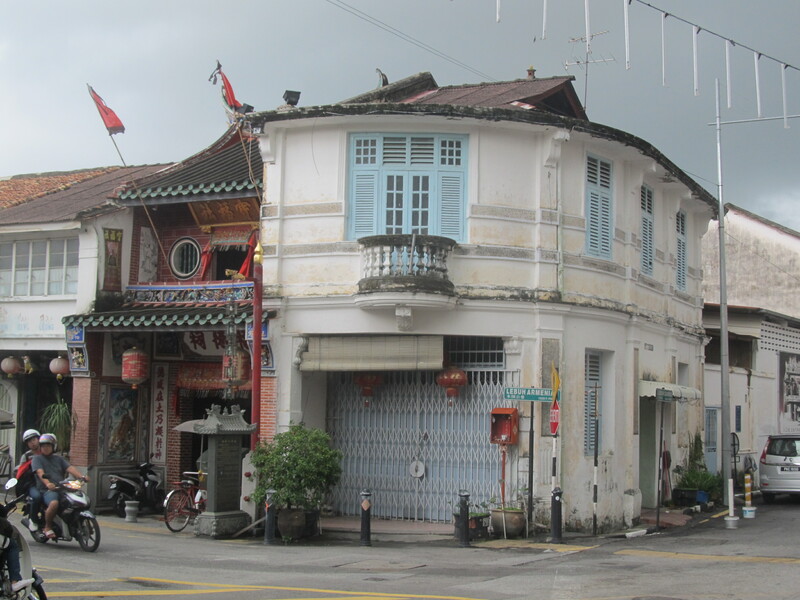 Historical Georgetown is a throwback to colonialism and the old British Empire. It’s packed with interesting temples, something Langkawi is definitely lacking in. One of the main attractions in Penang is the Cheong Fatt Tze Mansion, a bright blue building with unique interior (and outer) design. If you visit be prepared for a long lecture which varies in its level of interest considerably. To be honest, I wasn’t overwhelmed by Georgetown. The fact that it rained from the start to the end of my stay there probably didn’t help. My travelling friend and I had a hard time finding a decent place to stay and ended up in a windowless cell of a room. We didn’t mind as it’s not as if we were there to sit in our room, but the endless rain made enjoying Georgetown kind of difficult. We spent a day running from temple to temple and hiding inside for as long as possible. The Tong Keng Seah temple was particularly peaceful and haven-like, I must admit. What goes in Georgetown’s favour is the food. My god, it was wonderful. We found a busy tandoori restaurant on our first night and between us ate an entire chicken. It was the best tandoori I have ever tasted. A little gem of a breakfast café was happily discovered and frequented every morning we were there. We lucked out at lunchtime whilst hiding from the rain in a traditional Malaysian establishment. I ascertained from the amount of staring that they weren’t used to tourists in this place, and the hostess helpfully ordered for us as she was the only employee that spoke English. 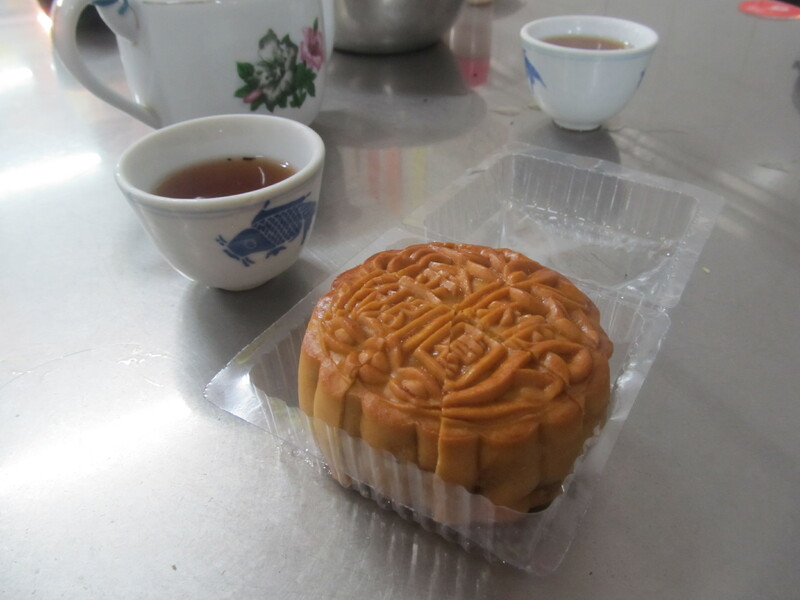 After an amazing broth of crunchy noodles and fresh vegetables, we tried a Moon Cake. Part of Chinese culture, these confectionery pastries are baked mid-Autumn in celebration of lunar worship. I can confirm they are extremely tasty and worth a try if you are in Asia around the moon festival. Fillings range from durian (yuck), coconut or five kernel – a tasty mix of nuts and seeds. We swapped half our cake with the lady on the next table and tried her flavour too. Moon cake and Chinese tea. In summary, Georgetown is a great place to experience amazing Malaysian food and culture, as the population is happily ethnically diverse. It was just a shame about the rain. Just look at all that tea. It was time to get high. 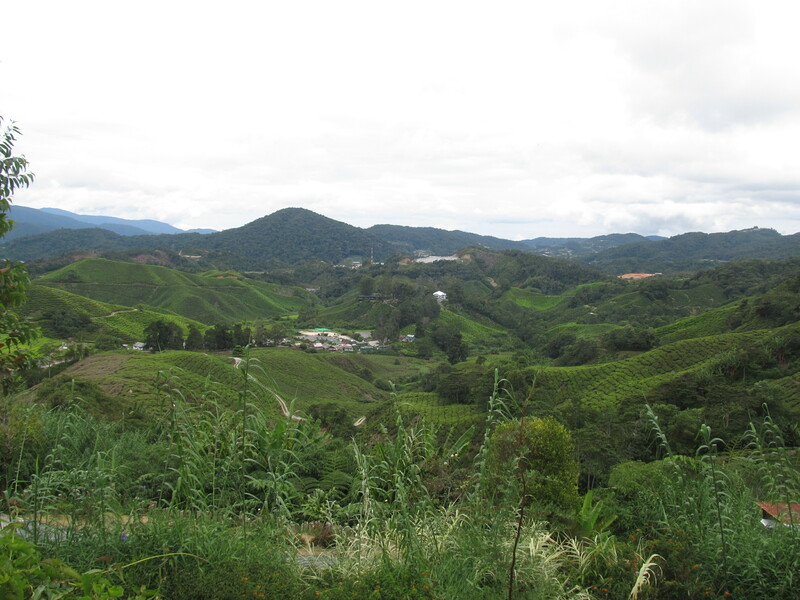 The Cameron Highlands are an oddity of Malaysian geography. The altitude means the temperature is a cool 20 degrees Celcius pretty much all year round – perfect for growing tea and strawberries. Having been craving a decent cuppa since I left England, I was understandably excited about tasting some of Malaysia’s finest. The hills are lushly green – a welcome change of scene after spending so long on sunny beaches. The cooler weather was a slight shock after the heat of the coast. I ended up sleeping with a fleece and socks on; it was almost like being back in the UK. The tea, though, was worth the long bus ride. We decided to get some exercise and walk up the hill to the Boh tea plantation – the largest and most famous tea brand in Malaysia. After a little tour around the tea crops and the museum, where I was interested to learn how tea is actually made, we got to the main event – drinking tea. Back home I consume on average about five cups a day of the stuff, and am something of a tea snob when it comes to brands and brewing time. The Boh tea was very tasty, don’t get me wrong. But they only gave us one small pot and no extra water. I could barely get a cup and a half out of it – and it wasn’t cheap. Slight disappointment there. 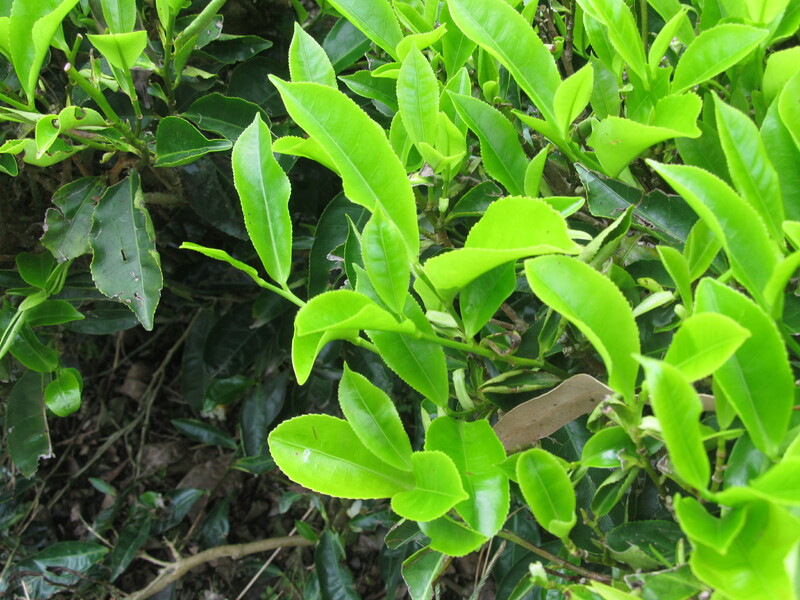 Tea in its natural form, before they do all the stuff that makes it taste so good. Next we hitched a lift back down the hill with some typically friendly Malaysian girls, and wandered down to a ‘butterfly park’. You will find these animal parks all over the Cameron Highlands. Maybe we picked a bad one, but we were not impressed with what we discovered inside. The animals were mostly dead, or dying, or overcrowded and in dirty cages. It was quite a disturbing sight and we were both a little upset by the carnage that we discovered in there. Leaving swiftly, we ventured to a nearby strawberry farm where we sampled scones with cream and, obviously, strawberries. They were a welcome change for the palate after surviving on Asian cuisine for so long. 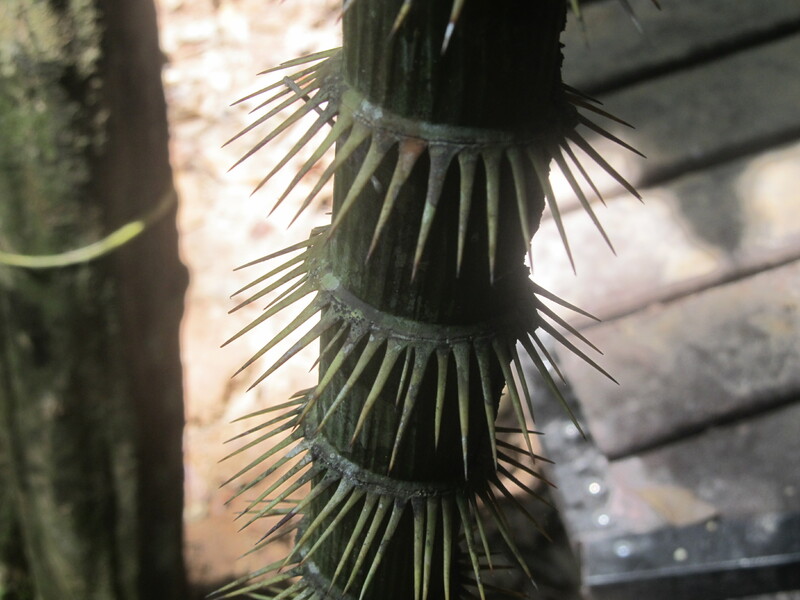 The jungle can be a dangerous place. To the jungle. Taman Negara is only reachable via river or one road. We came in by boat and left in a minivan after two days of trekking and nature spotting. The canopy walkway through the treetops is a great experience if a little unnerving. My friend and I decided to conduct our own trek through the rainforest with the vague paper map the information centre gives out. We chose a medium difficulty trek of 5km, up to a mountain viewpoint. A few things we learned on the trek: when they say bring more water than you think you’ll need, they mean it; Malaysians can’t measure distance and when they say ‘1km’ it’s more like 2.5km; cheese flavoured crisps will keep you going when you’ve run out of water and don’t know if you are on the right track anymore. It was a hard slog up the hill, especially as the built track ended halfway up and we had to struggle onwards from tree to tree. The view may have been worthwhile; I was too knackered to appreciate it. The way down was equally tough and we didn’t encounter a single other person the whole time. Slight panic set in when we didn’t see a sign for about 2km and our water supplies were gone. We made it back in one piece, a couple of hours later than planned and beyond sweaty and exhausted. The only wildlife we had encountered was a deer. More successful was our night jungle trek which was absolutely amazing. I had never realised how many spiders exist in the world. 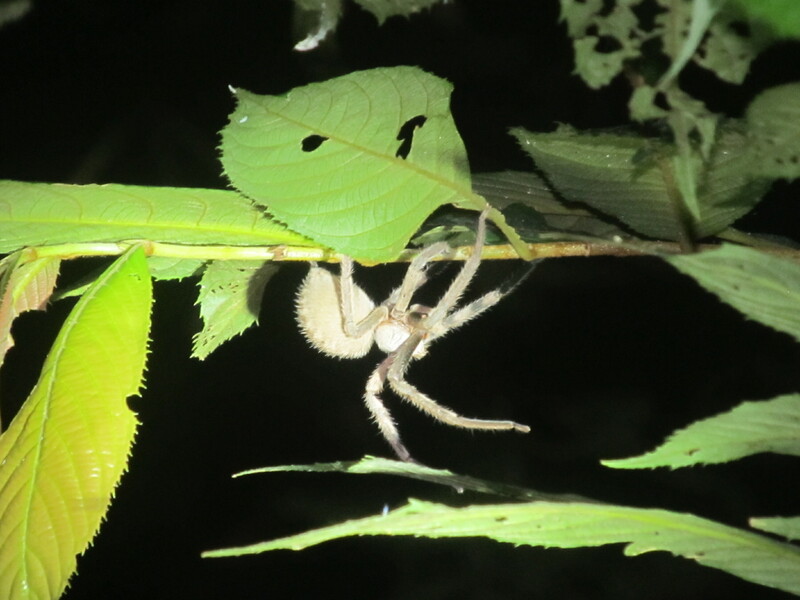 We were lucky to spot the largest species in the world: an impressively scary bird eating spider. Snakes, a scorpion, millipedes and more deer were also excellent spots. I got excited at the end of the trek when we came across fresh elephant dung, but sadly we didn’t see any wild elephants. On the way back we were accosted by a tapir which inquisitively sniffed us before wandering off into the darkness. There’s not much I need to say about the Perhentian Islands, located off Malaysia’s northeast coast, except: go there. 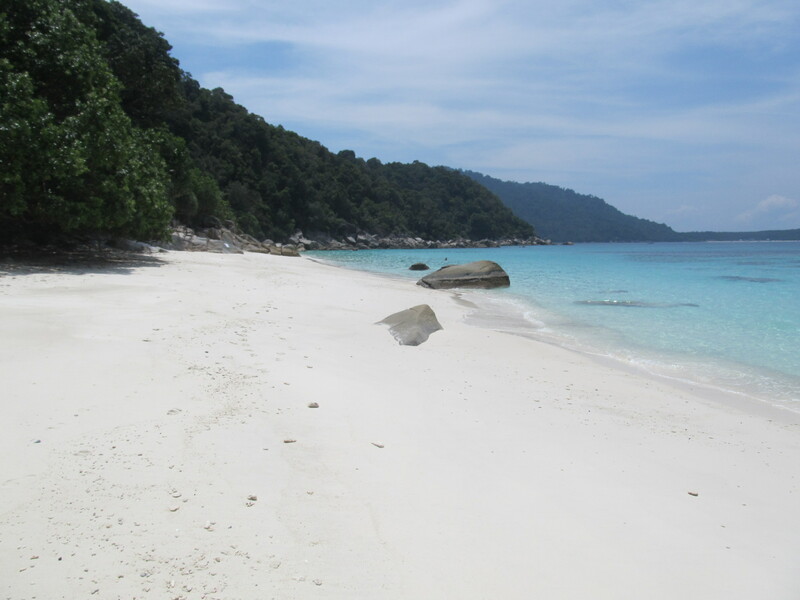 The two islands of Perhentian Kecil and Perhentian Besar are the epitome of beach paradise. Fairly undeveloped with blissful white beaches and crystal clear waters, there’s not much more you can ask for from a tropical island. As a self-confessed beach bum I was in my element as soon as I stepped off the boat. I stayed for five days on Perhentian Kecil, mostly relaxing with a sprinkling of diving and snorkelling if I felt energetic enough. I was thrilled to encounter a hawksbill turtle on my dive, but snorkelling was almost as good. Shark Bay off Perhentian Besar lives up to its name and I found Nemo more times than I could count. Now is the time to get yourself to the Perhentians, before they become too popular and inevitably are spoiled. The accommodation on Kecil is pretty limited and (as always happens with islands) overpriced. It’s also hard to get a decent meal there, which was the worst thing about the place. The local alcohol comes in the form of ‘Monkey Juice’, an orange flavoured rum that you can only purchase by the bottle, leading to unintended inebriation and associated memory loss. And finally we made it to the capital. After an exhausting couple of weeks flying to every corner of Malaysia, it felt good to be in a bustling city again. I had missed Bangkok, after all. Kuala Lumpur is a city on the brink of Westernisation. 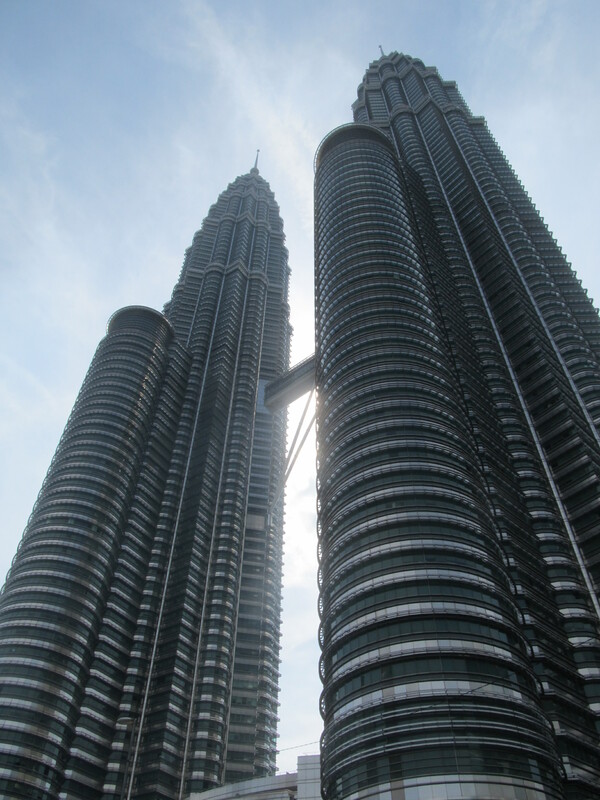 The iconic Petronas Towers are a showcase of modern architecture – from the viewing platform of which you can easily see the flimsy shacks of lesser neighbourhoods. It’s hard to believe when you are in KL that Malaysia is still classed as a developing country. However, if you look hard enough, there is evidence of poverty and degeneration hidden by the glossy skyline. We stayed in the Indian quarter and had a great time bartering at the Chinatown market. 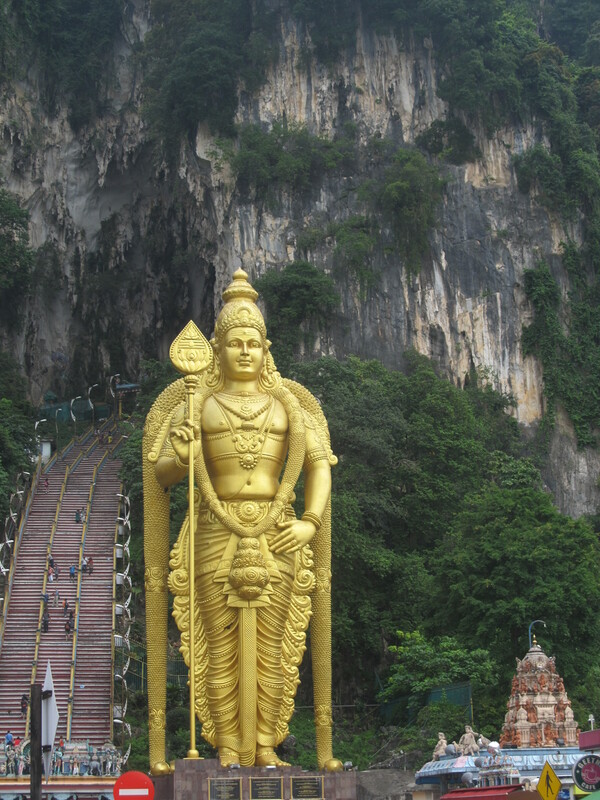 One must-see when you visit KL is the Batu Caves just outside the city. A cheap local bus ride away (don’t make the mistake of booking a tour), you climb the vertiginous steps to the caves which have been converted into a Hindu temple. They are also home to a troop of intimidating monkeys that you feed at your own peril. It’s an interesting place; plus the vegetarian Indian restaurants back on ground level provide excellent post-cave refreshment. If you visit KL, I highly recommend the Reggae Mansion hostel. It’s the best hostel I’ve ever stayed in by miles and is akin to a hotel in terms of luxury and facilities. From developed islands to deserted ones; from clear waters teeming with life to the epic modernity of the Petronas Towers; offering more flavours than you can imagine; drinking tea in the chilly mountains and hiking through the sweltering rainforest – Malaysia is a amazingly varied and fascinating country. You’d be a fool to miss it. You should definitely give Malaysia a look, it’s such a unique country. The night trek wasn’t scary, although I guess an arachnophobic wouldn’t have enjoyed it.